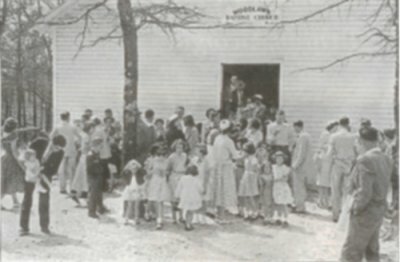 Woodlawn Baptist Church, located high atop Sand Mountain in Dade County, Georgia, was organized on August 30, 1939. The organizational presbytery met under a brush arbor located across the road from the church&apos;s current site at 5681 Highway 301 North. The presbytery consisted of Rev. Francis Marion Ott, James Smith, Jr., Davis Robinson and Lewis McBryar. The charter members received that day were Willie Hartline, Charlie Bodenhamer, Maggie Bodenhamer and Claude Stephens. Until a few months before new church&apos;s organization, the four had been members of Worley Chapel Baptist Church, located at the intersection of Worley Chapel Road and Poplar Springs Road. The Worley Chapel congregation disbanded when fire destroyed their meeting house. This freed the four individuals to become charter members of the new congregation. The name Woodlawn Baptist Church was chosen for the new church at the suggestion of Mr. Cleve Austin, who at the time was the principal of Davis School. The first deacons of Woodlawn Baptist Church were Willie Hartline and Charlie Bodenhamer. They purchased one acre of land from Ervin Harrison for the church site. The deed to the property states that Mr. Harrison was paid $25.00. Soon thereafter, construction started on a new church building. It was a large rectangular wood frame structure with white clapboard siding and a metal roof. The building was constructed with lumber donated by Willie Hartline, who was in the logging business at the time. As the Davis Community became more prosperous following World War II, the church building was improved to meet the needs of a growing congregation. During the early 1950s, a basement was constructed under the church building for Sunday school classrooms. A decade later, in the early 1960s, a pastorium was built on the west side of the church and additional classrooms were constructed at the rear of the church building. The first pastor listed in church records is Rev Claude Thomas. Rev. Tom Lane, Rev. Pearl Tinker, and Rev. L. R. Howell followed him in the 1940s. During the 1950s, the pastors were Rev. Conrad Morgan, Rev. Volney Callahan, Rev. Lewis Gaddis, and Rev. Ray Cosper. Rev. Roy Cordell and Rev. Floyd Higgins served as pastors during the decade of the 1960s. Rev. C. E. Reece was pastor from 1969 to 1973 followed by Rev. Doyle Phillips from 1973-1982. Rev. Penny Clark became pastor in 1982 and was followed by Rev. Jim Reynolds who served from 1987-1993. Rev. Robert L. (Bob) Patty, who began his pastorate on October 31, 1993, served until October 31, 2001. Rev. Doug Jensen was the interim pastor the first eight months of 2002. Rev. John Eldridge became pastor September 15, 2002 and served until August, 2005. Rev. Doug Jensen again filled the pulpit as interim pastor until the church called Rev. Clay Moreland to be pastor. Rev. Moreland officially began his pastorate on Christmas morning, December 25, 2005. Education has always been an important mission of Woodlawn Church. Very early in the church&apos;s history, a Sunday school was established with Henry Elliott as the first superintendent. Training Union classes, later called Discipleship Training, began in 1948 with George Grant as the first director. In 1960, the first Woman&apos;s Missionary Union was started with Mrs. Dimple Godwin as the leader. A few years later a men&apos;s mission group called the Brotherhood was organized. In 1968, Woodlawn Baptist Church purchased three acres of land adjacent to the original church site for future expansion. The deacons who signed the mortgage were Winfred Hartline, George Grant, Almer Godwin, Henry Elliott, and Elijah Elliott. The indebtedness on the land purchase was paid off in 1971. The church then borrowed $10,000 to add a vestibule to the church building and to brick the exterior. Because of rapid growth in membership, the church voted on July 8, 1975 to construct a new church building adjacent to the original building. A cornerstone laying ceremony was held on the United States bicentennial date — July 4, 1976. The basement level of the new structure, which cost $40,000, was constructed first and used as classrooms, while work on the new sanctuary proceeded very slowly. The upstairs portion of the new building was completed enough for a baptismal service to be held in it on Easter Sunday 1981. Many months passed, however, before the beautiful new sanctuary, which cost an additional $40,000 was finished. Rev. Alvin (Al) Davis, director of missions for the Lookout Valley Baptist Association, preached the first message in the new facility on December 9, 1984. The building was officially dedicated to the glory of God on March 17, 1985. The dedication service was delayed a few weeks so the ailing pastor, Rev. Penny Clark, who had suffered a heart attack, could attend the special event. A special note burning service was held on June 28, 1992 to celebrate the repayment of the construction loan and the church&apos;s debt-free status. The original church building was remodeled to serve as a fellowship hall. Through the years many men have served faithfully as deacons of Woodlawn Baptist Church. In addition to those already mentioned, past active deacons include Donald Ellis, Wayne Moore, Virgil Smith, James Hawkins, Charles (Chuck) Robinson, Ricky Buffington, Bill Seymour, Ralph Lane and C. D. Wright. The deacons who currently (2015) minister to the church alongside the pastor, Rev. Clay Moreland, are Bill Bankson, Roger Burrell, Edward Carter, Rusty Cooper, Steve Davis, Rayburn West and Jimmy Wright. In 1988 the church called its first paid minister of music, Rev. Alan Flowers, who served until 1995. Mr. Bruce Bradford was called in February 1996 and served until 1998. Mrs. Debbie Burrell was selected to serve as the third paid music director in June 1999 and remains in that position. Growth in church attendance as a result of the purchase of two Ford vans in the mid-1990s, led to the calling of the church&apos;s first paid minister of youth. Rev. Mark Williams was called as bi-vocational minister of youth in September 1998. He served until August 2000 and was followed by youth minister Mr. Billy Brandon. Billy stepped down from the position in 2014. A vision for expanding the church&apos;s parking area in the near-term and the church&apos;s meeting space in the long-term led to the purchase of 3.65 acres on the eastern side of the church site. The purchase was finalized debt-free in August, 2001. Several months later, on November 12, 2003, a Building Proposal Committee consisting of Debbie Burrell, Troyce Burrell, Steve Davis, Chuck Hawley, Bill Seymour, Diane Tinker, Alan Wright and C.D. Wright was formed to make preliminary decisions regarding the possibility of constructing of a Family Life Center. In August 2004, the church voted to proceed in that direction by receiving monthly "Joash" Offerings each fourth Sunday for a period of one year. The goal was to raise $50,000. A Building Construction Committee composed of Chuck Hawley, Bryan Howard, Mike Smith, Kerry West and Alan Wright was elected in October, 2005. Construction got underway shortly after three deacon trustees signed a Contractor Agreement with Jimmy Traylor Construction Co. of Rainsville, AL for $345,200 on December 15, 2005. Twenty-two months later, on October 7, 2007, Mrs. Grace Elliott cut a ribbon at the entrance to the new Family Life Center to kick-off the dedication program for the 80 feet by 100 feet multi-purpose building. On October 18, 2015, Dr. Eddie Rushing, Director of Missions for the Lookout Valley Baptist Association, was the guest speaker at a special worship service to commemorate paying off the center&apos;s indebtedness early — in eight years rather than the allocated thirty years. Immediately following the sermon, the pastor, Rev. Clay Moreland, presided over a brief note-burning ceremony on the steps of the family life center hallway. Barbara Carter, the church treasurer, assisted the pastor in setting a copy of the $267,395 original bank loan contract on fire. The deacons and several members of the church building committees also participated in the ceremony. To God be the glory for Woodlawn Baptist Church&apos;s growth from a simple brush arbor in 1939 to the beautiful and spacious church it is today. Great things the Lord has done!